No poo is short for no shamPOO – ‘poo’ referring to the chemicals and synthetic ingredients often found in hair care products. Going no poo simply means the removal of products like shampoo and conditioner from your routine. Before shampoo became shampoo as we know it, people just used soap. Shampoo used to mean a head massage with oils and herbs. In the early 1900’s, the meaning of the word shampoo started to change: English hair stylists started adding soap shavings and herbs to water in order to clean and fragrance the hair. This substance (rather than the act of head massage) became know as shampoo. ‘Modern shampoo’ was later introduced in the 1930’s. 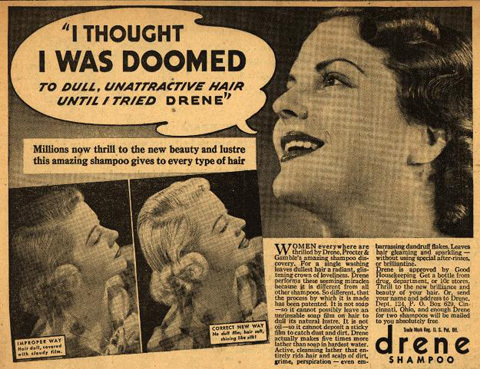 Drene (Procter & Gamble) was the first synthetic, no soap formula shampoo. What are the benefits of no-poo? Healthier hair: Google “no poo” and you will find lots of people who are doing it and say their hair is in much better condition that it was when they were piling on the shampoo and conditioner. Hair re-balances: The more you wash your hair, the more oil it produces to replenish what has been stripped away – think of it as supply and demand. Shampoos strip oils from the hair to make it feel clean. Washing it with water will not strip these oils away as easily and therefore, hair won’t need to produce as much oil to protect itself. Reducing dependence on products: Never have to buy or use shampoo again – discovering you don’t actually need all the products advertising tells you you can’t live without. Chemical free: Shampoos and conditioners contain many undesirable ingredients. To name a few: parabens, alcohol, sodium lauryl sulphate, mineral oil and other surfactants. Save money: Some baking soda and apple cider vinegar will cost a fraction of the price of shampoo and conditioner…if you want to use something even cheaper than baking soda and apple cider vinegar, plain water is the next best thing! Save plastic: Most shampoos and conditioners are packed in plastic bottles. If the plastic they are made from isn’t recyclable, or your local council don’t collect that type, it has to go to landfill instead. Glass or refillable bottles are a good choice for cutting down on plastic bottles. If you do opt for hair care packed in plastic bottles, look for those that are phthalate free. Phthalate’s are softeners (plastisizers) added to plastic to make it bendy and flexible. These can migrate in small amounts into the contents of the plastic container. Better for the fish: Everything we put on our bodies in the shower or bath goes into the water. There are many natural shampoos (low poo) that are biodegradable – meaning they can be broken down by bacteria and microorganisms in a way that isn’t harmful to living things. Transition period: If your hair is use to being washed everyday, it will have a ‘cycle’ for grease production. It can take time for hair to adjust and break this cycle – during which time it can feel very greasy as your hair still thinks it needs to produce as much sebum as it did when it was being washed every day. Balance of baking soda: If not used properly, the baking soda can dry your hair out. If this happens, it is usually because too much is being used. It can take time to figure out how much baking soda you need to use for your hair type. I think the motto to remember here is, ‘it’s easier to add than take away’. How do you go no poo? Just water: Avoiding any form of cleansing agent whatsoever and just relying on water to clean hair. Baking soda and apple cider vinegar: This seems to be the most popular choice amongst no-poo’ers. A very small amount (too much can make hair dry) of baking soda mixed with water is used to remove dirt and grease from hair. The apple cider vinegar is used afterwards to add shine, detangle and make hair soft. The Traditional Mexican No Shampoo method: A washcloth is used on wet hair to evenly distribute sebum. Brushing from the roots to the ends of hair means sebum doesn’t sit at the roots and make hair look greasy – instead it is distributed evenly down the hair shaft. If mixing baking soda and vinegar rinses sound like too much hocus pocus, you could seek natural, chemical free alternatives to shampoos and conditioners – known as ‘low poo’. Natural shampoo bars: One of my favorites is Pure Nuff Stuff’s lemongrass hair and body bar. It contains all natural ingredients that don’t leave hair feeling stripped, dry or frizzy. Another bonus is that it is wrapped in paper, so no plastic bottles. Liquid soap: Natural liquid soaps can make great shampoos and they can be used as shower gel and hand soap too. Dr. Bronner’s lavender liquid soap is ideal for use on your body and hair. Almond oil: Almond oil (and other oils) is a great natural alternative to conditioner and is perfect for smoothing down frizzy or fly away bits of hair. Applying a little to the ends of your hair before you go to bed makes hair very soft in the morning. If you are going the water only route, this could leave your hair greasy as you aren’t using anything to remove oil build up. If your hair needs a deep condition, you can gently heat the oil before you apply it to your hair – making it a great alternative to shop bought hot oil. Homemade: There are many food based ingredients ideal for homemade hair care recipes including eggs, avocado, lemon juice and herbal tea. Making homemade hair care products is fun and means you can create custom products for your hair. so.. during the transition period, it should be perfectly okay to wash with water everyday if necessary, right? i have tried this before and i always rinsed my hair every morning. that doesn’t delay the transition period any longer than it has to be? That’s fine, it’s just products like shampoo that would ‘reset’ the transition period. If you want your hair to feel fresher, you could try making some simple herbal infusions (1 heaped teaspoon of fresh herbs/flowers per cup of boiling water) or add a couple of drops of essential oil to the water.